This is a comprehensive livery agreement for yard owners providing "do-it-yourself" (DIY) livery services to horse owners, where the yard owner provides a loose box, and basic facilities, but the horse owner feeds, exercises and generally cares for the horse. The agreement sets out your reduced responsibility for the horse or pony while it is on your property, details and prices of services (including additional services the owner may choose to buy from you), and of course details of the horse or pony. This is a comprehensive livery agreement for yard owners who provide a loose box and basic facilities to enable an owner-client to look after his or her horse. The agreement provides legal protection for the yard owner while also giving you a broad framework covering every aspect of your prospective requirements for your contract with your owners. By using this agreement, we are sure you will spend far less time wrestling with client issues, great and small. This DIY livery agreement is suitable for any yard. It is drawn very flexibly so as to give you the opportunity to edit it easily to suit the exact way you do business. Although it is drawn to protect your interest as strongly as possible, the draftsman has also considered what your clients will think when you send it to them. Your owners will not worry that they have to see a solicitor before they sign. However, as you read it, you may decide to soften some of the strictest suggestions we have made. This Net Lawman DIY livery agreement is written as a business tool that you can use for every client. It confirms your terms and their instructions. It compels a client to tell you basic facts about the horse and to disclose any vice. In a word, it enables you to plan and manage more efficiently. You can also use the livery agreement to explain how the yard works and set down your practical rules and expectations. 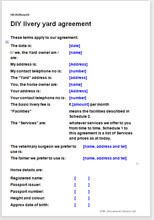 Yard procedures are given at the end of the document, and you can edit these to your exact requirement. A license is not required to operate a livery yard. The law in this agreement is common law, so you can make the deal that fits both parties best. Either you can edit the agreement to be your terms and conditions (and use the same version for all customers) or you could edit this contract for each horse or pony you take. Of course we take it for granted that you are aware of equine welfare issues, but they do not impact directly on your contract with your owners. This agreement is suitable for a DIY livery. For full livery see: Livery agreement.